Maitland’s Fright Night is a free event for children dressed in their best Halloween costumes! 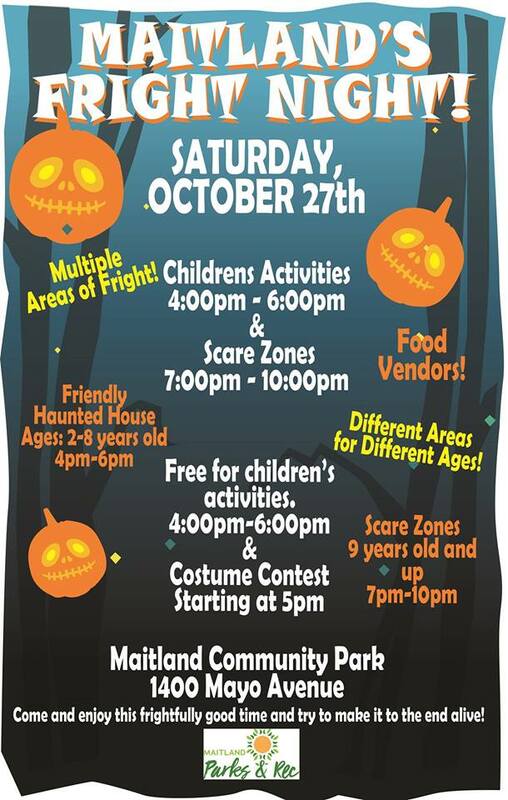 The event is from 4:00 to 10:00 p.m. on Saturday, October 27th, 2018, at Maitland Community Park with games, snacks, inflatables, and a children’s haunted house. At 5:00 p.m. children may enter at a costume contest. Young children can enjoy friendly Haunted Houses from 4:00 to 6:00 p.m. Beginning at 7:00 p.m., older children, 9-years-old and up, may visit Scare Zones until 10:00 p.m.
Food vendors will be on property with snacks and light meals available for purchase. This entry was posted in Family and tagged annual events, costume contest, fall, halloween, Haunted House, maitland, october, trick-or-treat. Bookmark the permalink.